If you had your thymus gland removed as a child, you could have an increased risk of developing autoimmune thyroid disease as well as other health problems later in life. While research has shown that the thymus is crucial to the development of a healthy immune system, further studies are necessary to determine exactly why the thyroid is especially affected by early thymus removal. Here's what to know about how this gland works and why its removal may have long-lasting implications. The thymus gland—which looks like two little horns sitting behind your sternum and between your lungs—produces and releases thymosin. This hormone's main job is to create T lymphocytes. (The T actually stands for "thymus.") More commonly known as T-cells, these white blood cells protect you from infectious agents, such as those that cause the cold or flu. T-cells also attack cancer cells. The thymus is only functional until puberty. After that, it starts to shrink—a process that continues for the rest of your life. Over time, it is replaced by adipose (fatty) tissue. When Is the Thymus Gland Removed? Usually, when someone's thymus gland is removed, it has nothing to do with the health or function of the thymus itself. Instead, it has to do with the location of the gland. Because the thymus is large in children, it is sometimes in the way when a child with a congenital heart problem needs heart surgery. 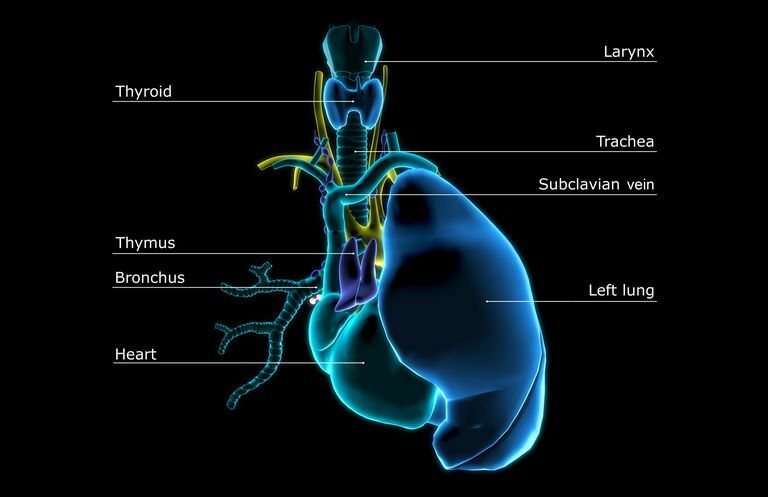 The only way to access the heart is to remove the thymus via a procedure known as thymectomy. Very rarely, a child may need a thymectomy to treat cancer of the thymus. Scientists believe that the autoimmune process can start in the thymus, since this is where the immune system’s T-cells develop; this would occur if the T-cells fail to recognize just one of the body’s thousands of proteins as the body's own. It is still unclear how this process in the thymus translates to the specific organs and sites that can be affected by autoimmunity, but it has been established that thymectomy in childhood increases the risk of thyroid disease. In a 2018 study published in the Journal of Allergy and Clinical Immunology, researchers looked at more than 5,600 people who'd had their thymus surgically removed before they were 5 years old; all of them had it removed in connection with surgery for congenital heart diseases. There were two control groups: one contained nearly 2,300 people who'd had heart surgery as children but hadn't had their thymus removed; the other was made up of about 56,000 people who'd never had heart surgery. Researchers found that the people who didn't have a thymus gland were more likely to have thyroid disease than people in either of the control groups and concluded that thymus removal is linked to the development of the disease. The risk of developing cancer was slightly elevated in those who'd had the thymus gland removed, as was the number of infections the patients experienced over time. A 2016 study also indicated a possible association between thymectomy and thyroid disease. It followed 11 children who'd undergone thymectomy along with cardiac surgery as infants. The children were examined before the operation, 18 months after the operation, and at 18 years of age to examine the immunological and clinical effects of having had their thymus removed. The researchers found that these children had a greatly altered immune system at 18 years of age, comparable, in fact, to the immune system of someone in their 60s or 70s, with a low number of T-cells. Because the study sample was small, more studies need to be done to confirm this association. As a result of recent research that links early thymus removal with an increased risk of getting thyroid disease, among other health problems, later in life, researchers are urging surgeons to avoid removing the thymus during cardiac surgery whenever possible. If you had your thymus removed as a child, be sure to tell your doctor so he or she can be on the lookout for thyroid problems, and familiarize yourself with common symptoms of thyroid disease. If you suspect you're having thyroid-related symptoms, bring it to your doctor's attention right away so you can be tested and, if necessary, treated. Fortunately, thyroid disease can be well-managed and doesn't have to have a major impact on your health or your life. Gudmundsdottir J, Soderling J, Berggren H, et al. Long-term clinical effects of early thymectomy: associations with autoimmune diseases, cancer, infections, and atopic diseases. Journal of Allergy and Clinical Immunology. 2018 Feb 14. pii: S0091-6749(18)30228-8. DOI: 10.1016/j.jaci.2018.01.037. Gudmundsdottir, J, et al. Early thymectomy leads to premature immunologic ageing: An 18-year follow-up. Journal of Allergy and Clinical Immunology. Volume 138, Issue 5, Pages 1439–1443.e10. 2016 November. DOI: 10.1016/j.jaci.2016.05.014. DeVoss, J, et al. Spontaneous autoimmunity prevented by thymic expression of a single self-antigen. J Exp Med. 2006 Nov 27; 203(12): 2727–2735. DOI: 10.1084/jem.20061864.